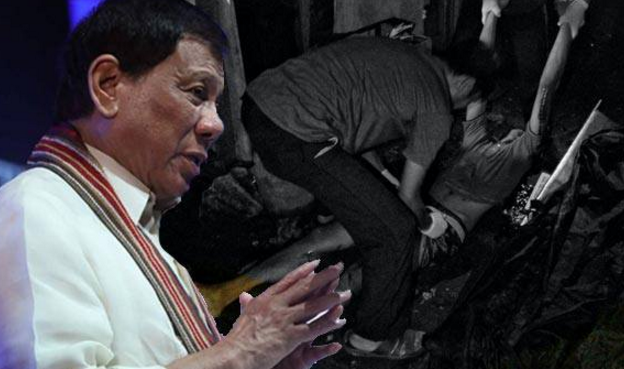 President Rodrigo Duterte promised to stand by the findings of the Department of justice-national Bureau of Investigation on the killing of 17-year old Kian Loyd delos Santos. "I saw the tape or tapes doon sa TV and i agree that there should be an investigation. Should the investigation point to liabilities by one, two, or all, there will be a prosecution and they have to go to jail convicted." President Duterte said. "But you know, let us wait for the investigation. And if the investigation points out liabilities, criminal liabilites, I will order the prosecution to the fullest to the extent of the law - to the full extent of the law. 'Yan ang magarantiya ko sa inyo." Duterte added. President Duterte declined to address claims made by the PNP that the grade 11 student was not as innocent as he was pictured by his parents and the media. "In fairness to the one who was killed, i cannot comment on that because there is an investigation. It could - equivocal pa ngayon eh.. whatever recommendation that the NBI would make will be our take on the case," the president explained. Duterte has distanced himself from cops who killed delos Santos claiming that he need not lecture them on how to go about their duty. "At tsaka wala ako diyan, diyan alng sa police level yan... Yun kasi yung 'go out and do your duty' you are not supposed to commit something which isn't your duty. You have no duty to murder a person," Duterte said. "Pero yung arestado na, nakaupo na diyan, barilin mo, that's another thing. that is... That would be murder of homicide, whatever. Sige," Duterte added.